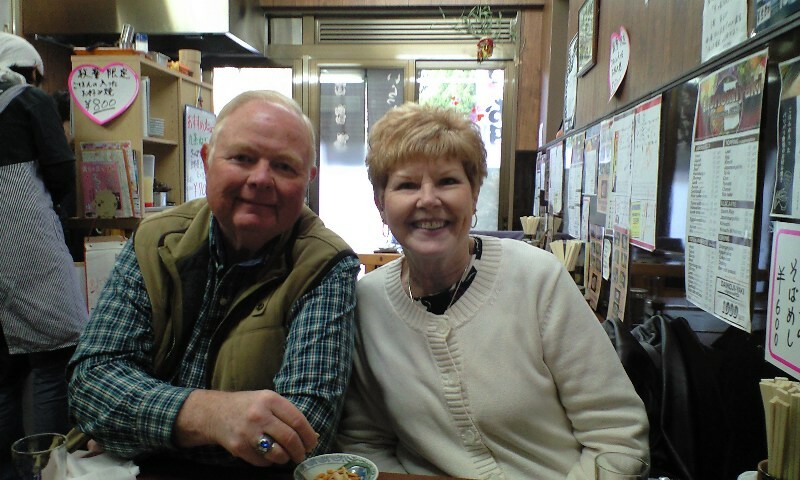 Kyoto private Guide: seeking cherry blossoms with American couple. We were heading for cherry season! The couple from USA had some Japanese friends, and had some pieces of advice over the trip to Japan. Before our meeting, they requested some places to visit. So, I made a plan according to their request. The first place we visited was of course Hirano Shrine. However, the day before, an unexpected thing happened!!! That was......snowing! Of course it was unusual! After cherry blossoms began to bloom, we had snow! My expectation that blossoms in Hirano shrine would be fully blooming was easily betrayed! (>.<)　But we still enjoyed about 50% cherry blooming. Later we visited Golden Pavillion and Ryoanji rock garden. Cherry blossoms in the both temples are more blooming than the week before! Especially the ones along the pond of Ryoanji were very beautiful. In front of Golden pavillion, we found an OKONOMIYAKI restaurant. 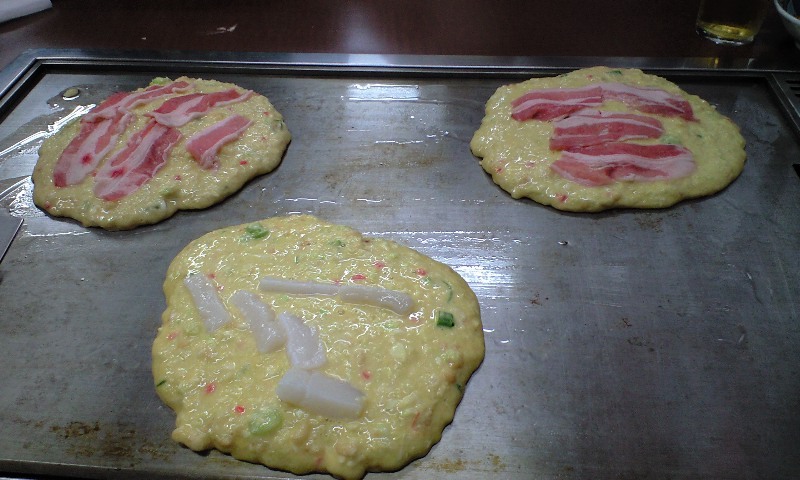 OKONOMIYAKI is something like a pan-cake. But its taste is quite different. 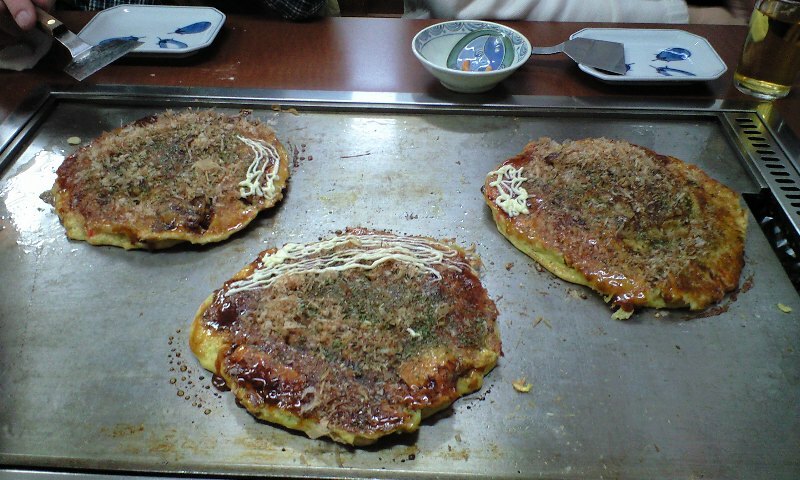 Some times it is called Japanese Pizza, which is, strictly speaking, not correct. First we mix all and put on the pan. Wait for three minutes. How do we know three minutes? In this restaurant, a sandglass for three minutes is on the table for you! And turn it over and wait for another three minutes! And again turn it over, and put source on it and wait! Here it is! The first day ended after visiting Kotoin,Nijo castle and Nishiki Food Market . The second day course was Sanjusangendo Hall, Kiyomizu temple, walking along Sanneizaka and Nineizaka to Yasaka shrine. Then I took them to Old Imperial Palace because they had a reservation. After giving some advice for the tour after the tour of Old Imperial Palace, I said good bye to them. I hope they enjoyed the tour of Old Imperial Palace and the one after that! !